Looking at what I had in the fridge and cupboards I decided to try out chicken and apples together thinking in seemed a very odd thing to do but that’s all I had available . Also we needed a way of using up the dry cider we had that I can no longer drink but its ok to cook with it. However the taste was really good and this will now be a favourite on our menus. And, of course it’s easy. The final positive came from one of my therapists yesterday when she talked about the fact of eating foods with flavonoids as being important for helping to heal head injuries such as I’ve had. Apples are high on the list! The following amount worked for two of us. Preheat the oven to 180-190C. About 10-25 minutes before cooking, season the chicken pieces well and set them aside. Use a flameproof casserole or heavy ovenproof pan and heat a little olive oil. Add the onion and cook till a little soft. Add 2-4 tbsps of the cider and continue cooking the onions until they’re very soft. Nestle the chicken pieces into the onion skin side up. Add the bay leaves too. Add the rest of the cider making sure it comes at least halfway up the chicken pieces. This is when you find you need more or less cider. Then turn it on to a high heat and boil it until the liquid is reduced by about a third. Cover the pan and bake in the oven for about 40 minutes. While the chicken is cooking melt the butter in a small pan and add the apple slices. Stir and soften the apple for about 5 minutes. Don’t cook it totally. Add the cider vinegar to the apples. Take the chicken from the oven and turn the oven up to 200-220C. 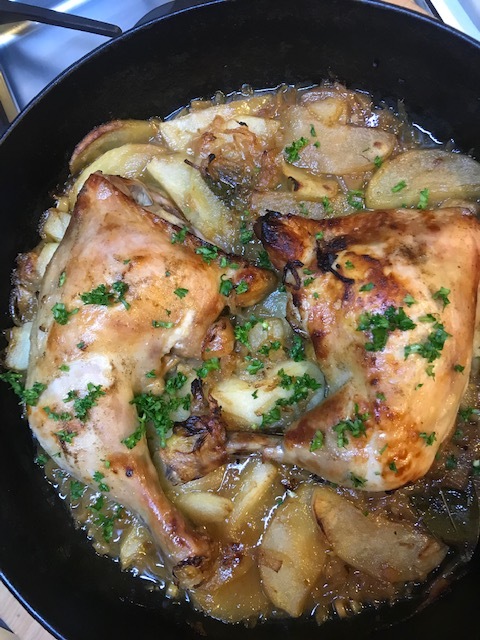 Add the apple slices to the dish – if it’s easier to manage, take the chicken out, mix the apples with the onion and nestle the chicken back in. Bake uncovered for about 15 minutes until the chicken browns adding a bit more cider if the liquid has reduced too much. Then it’s ready to serve!